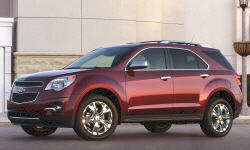 Need advice about a specific Chevrolet Equinox problem? See TSBs and recalls for the 2015 Chevrolet Equinox. 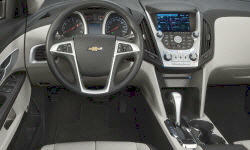 See repairs for all Chevrolet Equinox model years. 11000 mi Control module failed. Transmission would not shift out of park. Control module replaced. Memory for seats and mirrors acting erratically, loosing custom memory settings. Dealer downloaded revised software to the control module. 21200 mi A few times during the past 2 weeks the DIC display would occasionally go blank, but all systems functioned normally. Then one morning the engine would not turn over. Dealer replaced the battery under warranty. No problem since new battery. 19000 mi Oil leak detected on garage floor. Took to dealer who found the front crank shaft seal defective & replaced. 29400 mi Warped/distorted rotors. Rotors unable to be turned. Replaced under warranty. US $17 Driver's side headlight bulb went out. Chevrolet removed the headlight access panel from the wheel well liner starting in the 2015 model year. Must loosen/partially remove wheel well liner to gain access to the back of the headlight to replace bulbs. This took close to 2 hours from start to finish as it requires removal of torx head screws as well as body fasteners/pins. US $45 Vibration in front end when driving over 37mph. Took vehicle in to have tires balanced to try and resolve issue. Wheel balance smoothed out the ride, but did not cure vibration in the front end. US $5 Strong musty odor from vents when first engaging A/C. Purchased a can of disinfectant spray (e.g. Lysol) to spray through the system. After two complete treatment cycles, odor was virtually eliminated. Will treat system moving forward as preventative maintenance. 9920 mi Driver door lock actuator noisy during very cold days. 17300 mi Black trim pieces on door rusted after 5000 miles. 31000 mi The heater core had a leak requiring the entire dash be removed to gain access. The core was replaced and the repair took 3 days. US $35 Threw code for bad VVT solenoid. Replaced the intake and exhaust VVT solenoid as i could not determine which one was bad. Parts on Amazon were $35 for both where it was $54 each at part stores. US $24 My windows were fogging up when the heater was turned on. At this repair visit they replaced my heater core, which was leaking. Feb 2015 We special ordered the suv. The day we picked it up the onstar and nav did not work. The dealer had to order a new onstar module. It was installed a bit over a week later, and another week to activate an account. Now all is working fine. See our lemon odds and nada odds page to see vehicles with no repairs or vehicles with more than three repairs. To see how frequently 2015 Chevrolet Equinox problems occur, check out our car reliability stats.